1DS: Scottish Sports will take place August 17, 2017. In order to work through the sequence of Celtic Sport quizzes I am giving this short quiz about sports on the Isle of Man. 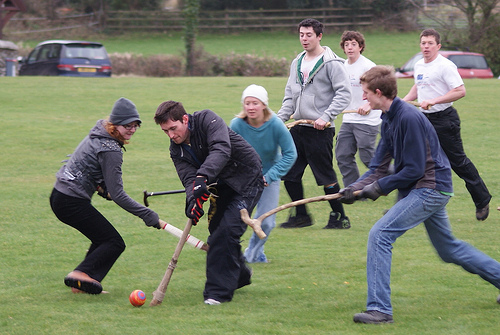 These people are playing cammag, a stick-and-ball sport related to Scottish shinty and what Irish sport? The Snaefell Mountain Course is a motorcycle racing road course used since 1911 for the Isle of Man TT and Manx Grand Prix. What is the significance of the number 252 (current to September 2016) in relation to that course? Manx athletes compete at the Olympics as part of Team GB. However they represent the Isle of Man at what quadrennial multisport event, which is contested by the countries and territories of the former British Empire? What cyclist has won 30 stage victories in the Tour de France, was World Road Race Champion in 2013, and was silver medallist in the Men's Omnium at Rio 2016?